I came upon this book on a list of recommendations for integrating faith and work. It does a good job of introducing people to the topic of worldview and specifically a Christian Worldview. He defines a worldview as a conceptual framework of fundamental beliefs. Lens through which we see the world. 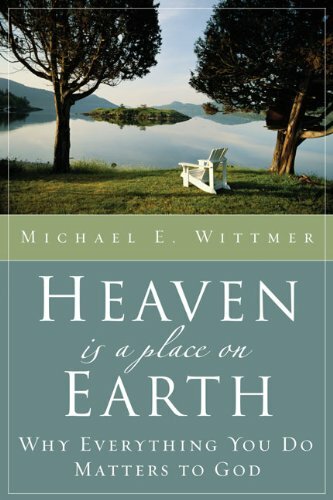 Wittmer begins with Genesis 1 and works his way through the Scriptures to Revelation. He discusses Gnosticism at length, including the current gnostic teaching which implies that anything physical is bad and that a Christian’s goal is to leave this earth. 1. It is okay to enjoy life here on earth and love God too. 2. Everything you do in life (work, family, church, etc.) matters to God and should honor God. The common Christian view is that the earth is a fallen place and nothing about it really matters since it will eventually burn. As a result, we should focus on Christian disciplines such as Bible reading and evangelism while we long for heaven. After all, this is not our home; we are just passing through, right? He states that evangelicals get it all wrong when they approach life that way. Most of our time after all is not spent on these disciplines, and sermons that address those topics just add guilt or are looked at as irrelevant to most people hearing them. The author states that it is not just in Christian disciplines, but in every area of life that we should serve to honor God. Wittmer writes that what we do here matters, whether we are making a meal, working in the yard, caring for our children, working in our vocations, etc. He lost me a bit, and I would guess others too, when he used the ontological and ethical categories. My primary problem with the book was that I felt that he under emphasized Christian disciplines and a longing for heaven to support his thesis. For example, he referred to worshipping God in heaven for eternity as boring. Worshipping a holy God boring? Boring? I agree with the author that we shouldn’t divide life into the spiritual and secular. Because of God, everything is valuable. We work because God worked. He highlighted the Reformers high view of all work. I liked his discussion of Sabbath rest, which he said was a goal of creation and salvation. Sunday is a day of rest, to become refreshed physically and for spiritual renewal. He discusses redeeming culture. Redemption restores creation, not obliterating it. He used William Wilberforce as an example of someone who made a positive impact in his world in his “secular” job. Wittmer looks at objections to his thesis in a final section of the book. The book includes discussion questions and helpful case studies. Overall, I felt some arrogance from the author as he put down Christian disciplines to emphasize his thesis.